UPDATE: In case NW Dharma News is unable to make these corrections in Ruby’s article, please note the following: Ajahn Chah’s original monastery is Wat Nong Pah Pong (not, Wat Na Pah Pong, which is another monastery in Thailand). Corrected spellings: Mun River (not Moon) and Ajahn Sao (not Soa). 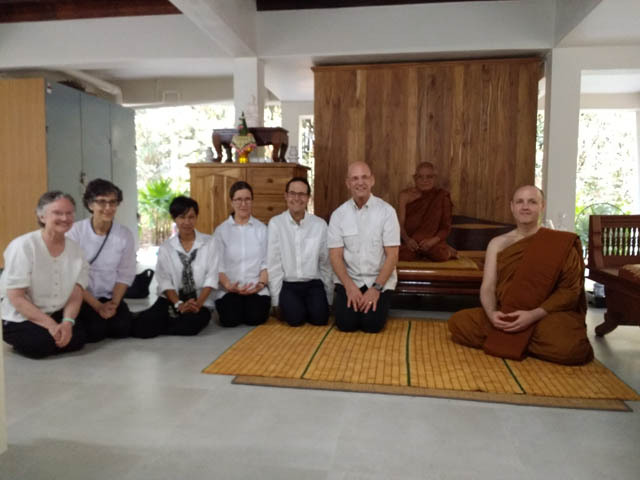 Check out Ruby Grad’s article in NW Dharma News about traveling to Thailand with several of our community members to honor Ajahn Chah and celebrate the 100th anniversary of his birth. Enjoy descriptions and photos of their travels. Left to right: Ruby Grad, Carole Melkonian, Krissy Martin, Joan Benge, Matthew Grad, Scott Benge, Luang Por Liem (barely visible in the back) and Ajahn Sudanto. Luang Por Liem was a direct disciple of Luang Por Chah and is the Abbot of Wat Nong Pah Pong.